The Teen events held at this center exemplify the fact that there are many, many great teens in our world. All are welcome and everybody will have a great time. Events in the center harkens back to the days of the grange hall dances, big community events that somehow bring everyone together to socialize, meet new friends, and try out some new dance steps; just as we did as kids. In 1856, a militia of 17 men returned to the Puyallup river valley after the end of the Indian Wars. At the present day location of Grayland Park and the Memorial Center, on what was then the North Bend of the Puyallup River, they built a blockhouse, Fort Maloney, for protection from future Indian attacks. After the Indian attacks stopped, Mr. and Mrs. John Carson operated a ferry crossing at this site for many years, and used the fort as their residence. In 1861, Fort Maloney became Puyallup’s first school, with Mrs. Emma Carson serving as its first teacher. The school had six students during its first year (2 of which were Mrs. Carson’s). At a starting salary of $50 per year, the city could not afford to pay her wage in full. Instead, they negotiated with Mrs. Carson to pay her wage over a 3 year period. The depression forming Grayland Park is the remnants of the former Puyallup River bed left after the river was re-channeled in the early 1880’s. In fact, before the river was “moved,” the bend in the river actually created an island in the middle of today’s Grayland Park. The island was popular with picnickers, who walked over a footbridge on the northeast side of the park onto the island. But, the area often flooded, so in the early 1880’s, J.P. Stewart paid a contractor $300 to have 25 Chinese laborers dig a new river channel bypassing the bend that is now Grayland Park. Beginning in 1909, the Army Corps of Engineers began dredging the Puyallup River and straightening out is curves. In the 1930’s, the Public Works Administration and the Civilian Conservation Corps began building the concrete levies that line the Puyallup River today. During the 1920’s, Grayland Park was a “tourist camp.” It was very popular with tourists who would spend the night on their way to and from Mt. Rainier National Park. Amenities included a community Kitchen, hot and cold showers, and modern toilets. The park was named after S.R. Grey, Puyallup’s mayor from 1921 to 1932. The war memorial was built as a tribute to the Puyallup servicemen who gave their lives for the country during WWII. To raise the funds, the entire Puyallup community was asked to stay home in mid-July 1948 between 7 and 10pm as canvassers went house to house gathering contributions. More than $19,000 was collected. 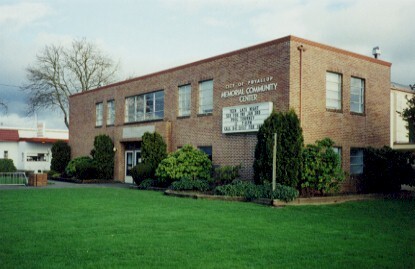 The end result was the construction of the city of Puyallup Memorial Community Center, which opened in May 1950. The park is named after Steven R. Gray. He was the a very well respected contractor in Puyallup during the early 1900’s, constructing many of Puyallup’s finest buildings of the time. He also served as Puyallup’s mayor from 1921 thru 1932. Well respected in the community, he contributed much to our architecture, and our government. Additionally, he was a member of the planning committee planning the War Memorial Building, and donated his services to supervise the building the Memorial Building on the site which was to become the park named in his honor.